Nestled under tall evergreen trees in the West Hills, Hillsdale is a close-knit southwest Portland community with a strong neighborhood connection, family friendly suburban feel, located just minutes from Portland. Offering the convenience of a reasonable commute along with the laid back, natural environment of a small town with quiet streets, perfect for raising a family or owning a first home. Hillsdale is filled with fantastic neighborhood resources, from a branch of the Multnomah Country Library, a large, year-round farmers' market, and beautiful parks including Hillsdale Park (with plenty of green space and an off-leash dog area), Dewitt Park, and George Himes Park, perfect for a family picnic or a walk with the dog. Numerous nature trails and environmental preserves create an oasis of green within the city limits of America's favorite green city, Portland, Oregon. One of the older areas of Portland, Hillsdale features homes in the cool shade of mature trees, established neighborhoods with older homes in a variety of styles, and a comfortable family friendly feel. Homes in Hillsdale have lush, green lawns and larger lots than other areas of town, giving a taste of rural life within the city. There are plenty of shopping areas in the neighborhood, and great dining and entertainment opportunity. Hillsdale really is the best of all worlds. Hillsdale's founding father John Addison Slavin settled in the area around 1850, establishing a substantial farmstead complete with a rock quarry, palatial house, and barn, connected by a farm road that would become Sunset Boulevard. Slavin helped construct what is now Capital Highway - then called Slavin Road - in order to provide himself access to the growing city of Portland. After Slavin’s death in 1908, his family parceled and sold off lots on the farmstead, and In 1917 the Slavin farmhouse was purchased by Dr. Edward A. Pierce, a pioneer of the open-air method of tuberculosis treatment. Dr. Pierce did substantial renovations to the building to create the Pierce TB Sanatorium, set in a very rural locale, literally steps beyond the Portland city limits, as a city ordinance required that such facilities be established outside the city proper. The healing center was closed in 1924, when Dr. Pierce set out to find a creative new use for the property. In 1925 the homestead was transformed into the Portland West Side Auto Camp, providing camp sites--often with cabins--for families desiring a convenient overnight spot or a stopover on a long trip. This camp, operated by George and Elsie Battey, included 25 furnished cabins in addition to the former Slavin house and sanatorium. Dr. Pierce passed away in 1948 at the age of 93, His widow, Martha, sold the property to a Portland developer who continued the auto camp another five years until finally closing the doors in 1953. For the next 30 years the old auto camp was quiet, and this lot vacant. Over time, the surrounding area gradually emerged as the commercial core of the Hillsdale neighborhood. In fact, Oregon pioneers began using the term “Hillsdale” as early as the 1880s. The name took hold over the next 100 years as stores, a park, and the local library branch also adopted the name. The Hillsdale neighborhood association voted in 1996 to firmly establish the neighborhood’s boundaries. The Hillsdale district is located directly southwest of downtown Portland, centered around a series of commercial areas on SW Capital Highway between SW Sunset Boulevard and SW Bertha Boulevard. Hillsdale is bordered by Interstate 5 and Highway 99W in the east. Capitol Highway runs through the middle of the neighborhood. Hillsdale borders Southwest Hills, Healy Heights, and Homestead on the north, South Portland on the east, South Burlingame and Multnomah on the south, and Hayhurst and Bridlemile on the west. Oregon Route 10 (the Beaverton-Hillsdale Highway) connects Hillsdale to Downtown Portland to the north and Raleigh Hills and Beaverton to the west. Hillsdale features many beautiful homes with well-tended green lawns and large lots shaded under mature trees, with easy access to neighborhood amenities. Some homes are perched on the South side of the hill with a stunning view of Portland sprawling out below. Hillsdale features many homes built from about the 1940's through 1980's although a few older and newer homes are mixed in. Typical home styles include broad ranches from the 60's and 70's, some contemporary, and some two-story traditional, "Old Portland" designs. If you are interested in buying or selling a home in Hillsdale, check out our Portland Real Estate Home Page for more information about the McDonald Group Realtors and visit our Portland Real Estate Map to search for Hillsdale homes for sale. Hillsdale Library (1525 S.W. Sunset Boulevard, Portland, OR 97239) : The newer library building was awarded LEED Gold certification as a "green building" in 2004. A number of design elements contribute to the building's official "green" status, including access to public transit, water and energy efficiency, materials that come from local manufacturers, and high indoor air quality. Hillsdale boasts a large collection of books as well as audio and visual materials, periodicals and electronic resources in English, Spanish, Russian, and many other languages. Hillsdale customers have access to Multnomah County Library's system-wide catalog of two million books and other library materials. The Multnomah County Library is the best library system in the world! Hillsdale Farmers' Market: This thriving neighborhood market is "Where The Harvest and Hillsdale Meet" on Sundays from 10am to 2pm. The market runs weekly from May through the Sunday before Thanksgiving, and twice monthly December through April. 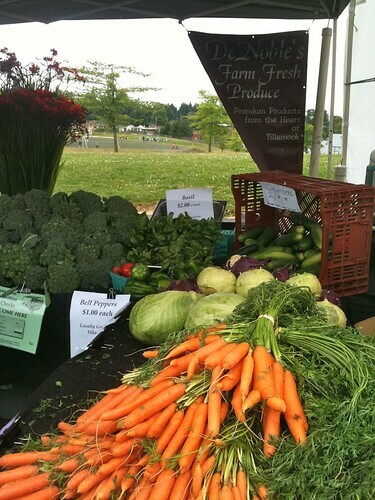 One of the only year-round farmers' markets in Portland, you'll never miss out on locally sourced produce, dairy, bread, meat, and artisan food products made in Oregon and Southern Washington. The availability of certain vendors changes from week to week, so be sure to check out their website to see who will show up, and check out this Location map for a closer look at the market space. Hillsdale residents are able to complete their shopping trips in a convenient central location, as numerous stores, bakeries, coffee shops, and eateries are all located just off SW Capitol Highway. You've got quick access to banks, dry cleaners and laundromats, clothing stores, ice cream shops, a pharmacy, pet wash and vet, the post office, and a video store. One of the area's favorite stores is the Food Front Cooperative Grocery, located at 6344 SW Capitol Highway. This member-owned CoOp brings stellar produce, groceries, and supplies to Hillsdale residents. While everyone is welcome to shop at the CoOp, members have special privileges and benefits, and support their local community. Alba Osteria: Inspired by the cuisine and wine of the Piemonte region of Italy, Chef Kurt Spak opened Alba Osteria in Portland’s Hillsdale neighborhood in 2003. The 48-seat Alba Osteria is influenced by the many small restaurants (“osteria”) in and around the Piemontese city of Alba. Their menu is Piemontese in inspiration but built around local, sustainable, and organic products. 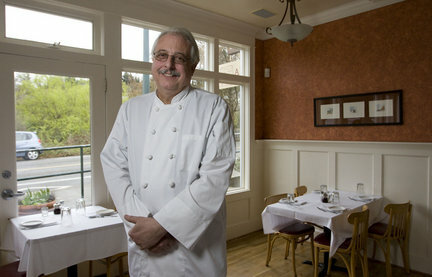 The menu changes frequently to take advantage of the Pacific Northwest’s seasonal bounty. The format is authentic osteria, with a variety of antipasti, several pasta dishes, including Piemontese mainstays tajarin and agnolotti dal plin, entrees, cheese, and dessert.